Tortoise Stew depicts small town Florida politics and the development of Florida at any cost. Kelly Sands is a reporter covering some of the more controversial and contentious issues in the north Florida town of Calloway. Dead armadillos and gopher tortoise carcasses are left as calling cards to those opposing the development as commission meetings erupt into all-out warfare. With the murder of one commissioner, Kelly begins an investigation that threatens to topple the carefully laid plans of the developers and politicians to bring a movie studio and landing strip within the city limits of the small town. When a young girl is killed by a semi-truck from Monster Mart, the environmentalists become even more vocal against the developers’ plans. The bomb sat in a bag on Kelly Sands’ desk for an hour before she noticed it. She didn’t see the white shopping bag because she had a deadline to meet, and tunnel vision ruled when the clock ticked toward the newspaper’s witching hour. The rest of the debris on her desk also prevented her from noticing anything new. Two stained cups still holding cold coffee from the morning sat next to a pile of files on long-term stories she kept meaning to investigate. A box that once contained donuts lay on top of the papers. Even if she had noticed the shopping bag, it wouldn’t have registered as anything unusual. Her colleagues were always depositing things on each other’s desks, either from absentmindedness or from the numbing blindness of a daily paper’s deadline focus. The Braidwood Tribune went to press at eleven most nights. Kelly glanced at the clock on the wall ticking away the minutes as she put the finishing touches on the story she had begun on her laptop at the meeting. She sped from the Commission meeting before it was even over. More than one hundred residents from around Zion County came to Calloway, a town ten miles from Braidwood. Braidwood was the largest city in north central Florida, standing in the middle of some of Florida’s last remaining natural landscapes. Five commissioners representing 6,000 residents had decided to annex 2,000 acres of land into Calloway. The land represented one of only few tracts of farmland left in the county. The annexation bothered some of the residents who believed the increased acreage into Calloway would stress already limited city services such as sewer and water. Buddy Tills owned most of the 2,000 acres for several decades, but he’d been selling off small parcels over the past several months. The names on the annexation requests were not local. The rumor mill kept mentioning Industrial Pines as the developer of the property. Just the name Industrial Pines evoked fear in some residents because they were a company that developed in Florida with little regard to anything but its own profits. B.J. Winters, president of the giant company, attended all the public hearings, but Kelly’s calls to him remained unreturned. She planned to corner him after the annexation meeting, but when it ran over her deadline, she was forced to leave without accosting him in the parking lot. Now Kelly had to write a fair, impartial article on a controversial annexation in Calloway in less than an hour. She knew if she didn’t get it down to bare bones reporting, the night editor would hack away at the piece until it fit into a twelve-inch space on the first page of the local section. Kelly would be thirty-five in a few months, but she still looked like she was in her twenties. Her long black hair contrasted with her light blue eyes, unusual in their intensity and translucence. She was a tall 5’4” only because she held her head high and kept her shoulders back. Thirty-five seemed like a milestone birthday to her. She had worked hard and earned a decent position with The Tribune yet she hadn’t accomplished much else in her life, except a divorce from Jerry, a college sweetheart. The marriage lasted only two years. Her parents, who lived in Palm Beach, could not understand why she hadn’t finished law school. It disappointed them she settled for the job of a reporter. “I don’t understand why you would work so hard for so little return,” her father, a pediatrician, often said. But her father did not understand what happened to her when she first caught the newspaper bug. She’d never gotten it out of her system after she worked on the University of Braidwood’s student newspaper throughout her undergraduate years. After she received her bachelors’ degree, she struggled through one year of law school, hating every minute of it, even more so because she no longer had time to write for the paper. When she finished the article, five minutes before deadline, she rubbed her eyes and then rested them on the bag for the first time. Carl Handler, a fellow reporter and friend, came by her desk and looked over her shoulder. “What are you doing here so late?” Kelly asked. “Must be a secret admirer,” Kelly said as she pulled out the tissue paper tucked in the top of the bag. “What is it?” Carl asked as Kelly stared at the contents of the package. Carl and Kelly stood with the shopping bag between them. Kelly held the handles wide enough apart for them to get a good look at the contents. Neither of them had ever seen a real bomb, but both knew enough to recognize that the plastic pipe with the small digital timer and battery attached with duct tape could not be anything else. I originally published Tortoise Stew in 2006 under my former name, Patricia Camburn Behnke. In 2012, I ventured into the world of ebooks with the publication of Live from the Road. 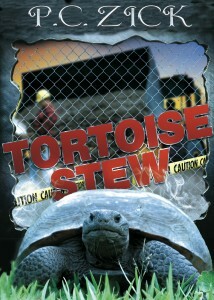 With a new cover and fresh edits, Tortoise Stew is now available on Kindle for .99 cents.